DEMO warning: If you want to try the demo version do not download it directly as keyboard events do not work in the strategy tester. [1-9] Manage selected opened or pending order. [TAB] Change operation type. Program can automatically guess the position type depending on the stop-loss, take-profit and open-price line, but if you don't use any of these then you must specify the order type. [S] Toggle stop-loss line. 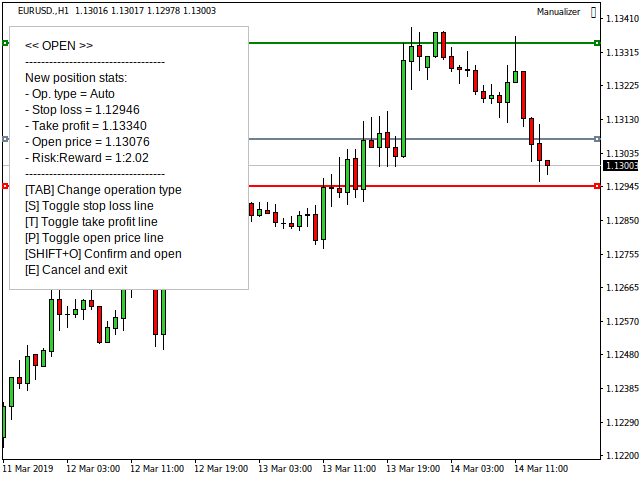 If it is hidden then the order is opened without stop-loss. [T] Toggle take-profit line. If it is hidden then the order is opened without take-profit. [P] Toggle open-price line for pending orders. If it is hidden then the order will be a market order (BUY or SELL). [SHIFT+O] Confirm and open the order. [0-9] Set x10% the position size to close. E.g. if you press 2, you will set it to close the 20% of the total position size. For an original 1 lot position, after closing the 20% the volume of the remaining position would be 0.8 lots. [SHIFT+C] Close the % specified in a market order or delete a pending order. [S] Toggle stop-loss line. 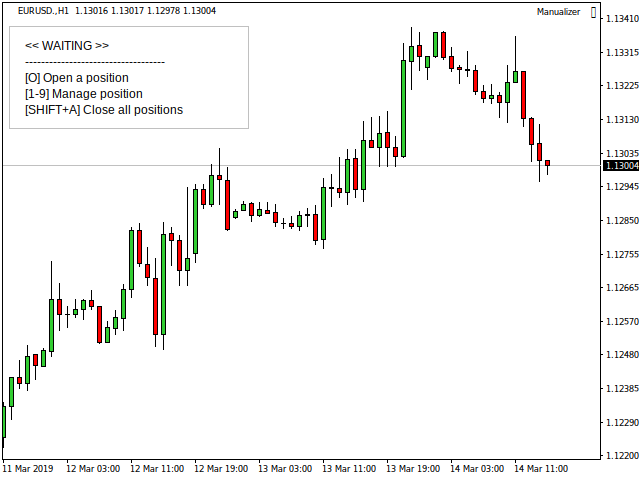 If it is hidden and the order previously had a stop-loss, then it is removed. [T] Toggle take-profit line. If it is hidden and the order previously had a take-profit, then it is removed. [P] Toggle open-price line for pending orders. [SHIFT+M] Confirm and modify the order. Max. slippage: Maximum slippage in points for opening and closing orders. Fixed lot size: Lot size directly specified by user and fixed for all positions. E.g. 0.10. Max. account money: Maximum money in account's currency for each trade. E.g. 30. % Account Equity: Maximum money given by the % of the account equity for each trade. E.g. 2. % Account Balance: Maximum money given by the % of the account balance for each trade. E.g. 1. Volume data: Its units depend on the volume calculation type chosen. 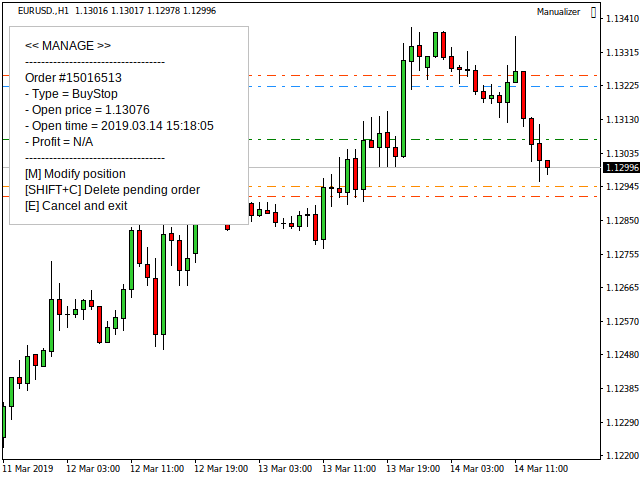 Lots when volume can't be calculated: If you set Volume type to a value other than Fixed lot size and try to open an order without a stop-loss, this field will be used for the lot size. 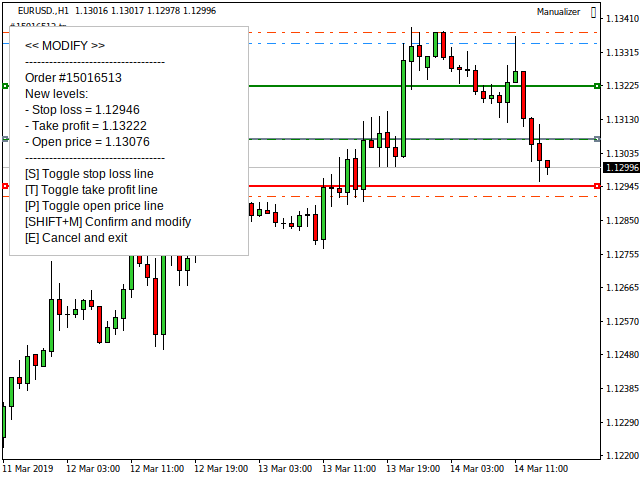 Enable virtual stop-loss and take-profit: Set to true if you want to use virtual levels. Distance in points between virtual and real levels: When virtual levels are enabled, the program also uses real levels as a security measure in order to prevent fatal losses if, for example, the connection is lost. Draw virtual levels: Set to true if you want to see the virtual levels lines. + Other self explanatory parameters for controlling visual aspects (text color, lines style, etc).